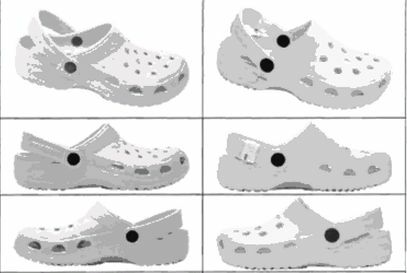 In Crocs Inc. v. International Trade Commission, 93 U.S.P.Q.2d 1777 (Fed. Cir. 2010), the Court of Appeals for the Federal Circuit reversed an International Trade Commission (“ITC”) finding of non-infringement that relied on a detailed verbal construction of a design patent claim. Due to the ITC’s reliance on the verbal construction, the Court found the ITC placed undue emphasis on particular features of the design rather than the design as a whole. 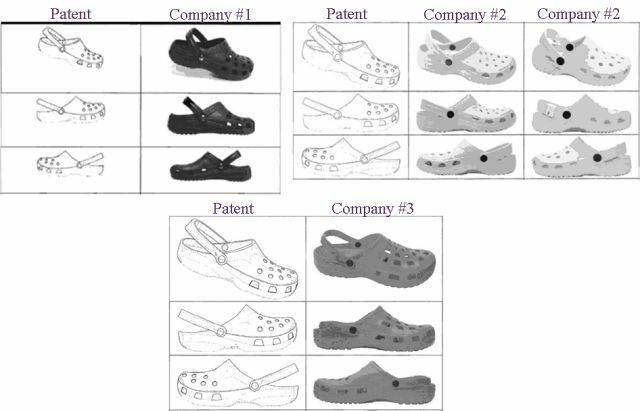 Crocs Inc. (“Crocs”) owns design and utility patents covering footwear (see, e.g., figure at left). In 2006, Crocs filed an ITC complaint against eleven companies, alleging unfair competition under 19 U.S.C. § 337 for importing infringing foam shoes. Section 337 empowers the ITC to bar importation of products that infringe intellectual property rights. After settlements and initial non-infringement determinations, five companies remained. 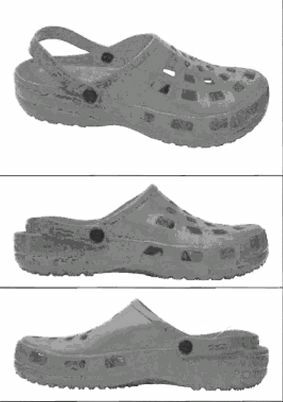 Crocs moved for summary determination of infringement of the design patent and the remaining companies cross-moved for a finding of non-infringement. The administrative judge found no infringement; after the Commission’s review and remand, the judge held an evidentiary hearing. In summary, when the ‘789 patent is considered as a whole, the visual impression created by the claimed design includes: footwear having a foot opening with a strap that may or may not include any patterning, is attached to the body of the footwear by two round connectors, is of uniform width between the two round connectors, has a wrench-head like shape at the point of attachment, and extends to the heel of the shoe; with round holes on the roof of the upper placed in a systematic pattern; with trapezoid-shaped holes evenly spaced around the sidewall of the upper including the front portion; with a relatively flat sole (except for upward curvature in the toe and heel) that may or may not contain tread on the upper and lower portions of the sole, but if tread exists, does not cover the entire sole, and scalloped indentations that extend from the side of the sole in the middle portion that curve toward each other. Company #1’s shoe did not infringe because (a) its strap does not have uniform thickness and does not extend to the heel of the shoe; (b) holes in the upper are not round; (c) holes in the upper are placed in a web-shaped, not systematic, pattern; and (d) a tread pattern covers the entire sole. Company #2’s shoes did not infringe because their straps are not of uniform thickness and do not extend to the heel of the shoe. Company #3’s shoe did not infringe because (a) its strap does not have uniform thickness and does not extend to the heel of the shoe and (b) holes in the upper are not round. The Commission affirmed the finding of no infringement on review, adding that the accused shoes lacked even spacing of ventilator holes around the front (toe) portion of the upper as depicted in the design patent. Crocs appealed the Commission’s final determination. The Federal Circuit reversed the Commission’s finding of non-infringement of the design patent and remanded for a determination of remedies. Stating that “this case shows the dangers of reliance on a detailed verbal claim construction,” the Court found that the claim construction’s focus on particular features led the administrative judge and the Commission away from consideration of the design as a whole. 93 U.S.P.Q. 2d at 1782. Under the ordinary observer test, “the deception that arises is a result of the similarities in the overall design, not of similarities in ornamental features in isolation.” Id. at 1783 (quoting Amini Innovation Corp. v. Anthony California, Inc., 439 F.3d 1365, 78 U.S.P.Q.2d 1147, 1151 (Fed. Cir. 2006)). 93 U.S.P.Q. 2d at 1783-85. These views suggest that an ordinary observer, familiar with the prior art designs, would be deceived into believing that the accused products are the same as the patented design. “In one comparison after another, the shoes appear nearly identical.” Id. at 1785. One of the overall effects of the design is the interaction between the strap assembly portion and the base portion of the shoes where the strap is attached to the base. Multiple major design lines and curves converge at that point creating a focal point attracting the eye of the ordinary observer when viewing the overall effect of the design. Another overall effect of the design is a visual theme of rounded curves and ellipses throughout the design, including the strap forming a sort of continuation of the sidewall of the base to create a visually continuous ring encircling the entire shoe. Other examples of rounded curves or ellipses in the design are the ellipses formed by the strap and the foot opening in the base. Id. Thus, the Court held that the accused products embody the design patent’s overall effect in sufficient detail to cause market confusion. Design patents provide substantial protection against competitors seeking to imitate the look of a successful product, especially in the wake of Egyptian Goddess Inc. v. Swisa Inc., 543 F.3d 665, 88 U.S.P.Q.2d 1658 (Fed. Cir. 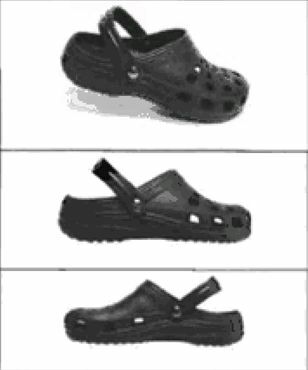 2008), and now Crocs Inc. v. International Trade Commission, 93 U.S.P.Q.2d 1777. Even if some isolated features differ, similar impressions created by the overall designs can be sufficient to show infringement. Any company selling products that incorporate ornamental features should consider obtaining design patents as well as utility patents and trademark registrations. Teresa Tambolas is an attorney with Pattishall, McAuliffe, Newbury, Hilliard & Geraldson LLP, a leading intellectual property law firm based in Chicago, Illinois. Pattishall McAuliffe represents both plaintiffs and defendants in trademark, copyright, and unfair competition trials and appeals, and advises its clients on a broad range of domestic and international intellectual property matters, including brand protection, Internet, and e-commerce issues. Ms. Tambolas’s practice focuses on domestic and international design, trademark, trade dress, and copyright law. The Court also reversed the Commission’s determinations that Crocs’s utility patent would have been obvious and that Crocs did not satisfy the technical prong of the domestic industry requirement of 19 U.S.C. § 337. This post does not address those issues.